There are so many pictures of dice to choose! Below you'll find a selection of pictures from different categories, including: color, black/white, games and popular culture. Click on the one you like for more info. Dedicated dice collectors also proudly display their pictures of their collections. You can view pictures of dice by visiting their web sites. I'll recommend two for you: Carmela's Dice web site and the Dice Collector. Quality stock photos make a web site or printed publication come alive. A picture is worth 1000 words; an old saying, but still 100% accurate. With stock photos, you get a professional picture and the legal approval to use it. You save time searching for and editing lesser-quality photos. If you need photos of dice or gaming, you must look at Getty Images. They offer 23 pages of eye-popping, gorgeous stock pictures of dice. If you're looking for the best selection and best quality, go Getty. You won't regret it. You'll get a great photo. If you're looking for stock photos on a budget, I recommend iStockphoto for a plentiful selection of dice photos. It is a subscription service, but well worth it. I've used it for several of the graphics on this site! In fact, I'd be happy to share my collection with you. 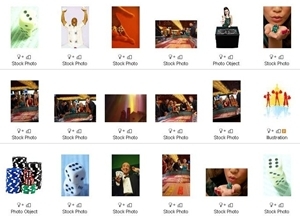 View dice pictures that I grouped together on my iStockphoto account. It is free to look. You need to buy them if you want pictures of dice without a watermark embedded on the image. Whether in color or black and white, dice pictures evoke strong feelings. Which one do you like? Artfire offers another source for dice photos. This dice picture shows an orange die with a simple background. I found these at Art.com. There are more to view too. If you visit their site, find the you'll find a search button. Type in "Dice" to find more photos.